Editor's Note: This is the second post in a two-part series on how sustainable agroforestry is helping to break the cycle of poverty and environmental degradation in Haiti. In case you missed it, you can read the first part here. An innovative, five-year community agroforesty development project developed and carried out by Timberland, the Smallholder Farmers Alliance (SFA) and Haitian farmers has proven successful. So successful, in fact, that Timberland is considering replicating it in other countries where farmers produce cotton and rubber – the raw materials the company uses to manufacture clothing, footwear and, more recently, tires. Partnering with experienced local NGOs who know 'the lay of the land,' leading proponents of corporate social and environmental sustainability such as Timberland are helping turn the tide and break the cycle of poverty and environmental resource degradation in Haiti. Through the SFA's community agroforestry development model, Timberland is helping boost agricultural productivity, small farmers' incomes, community well-being, and ecosystems health and sustainability. What's more, it is encouraging NGOs and local communities to come up with sustainable, market-based development solutions. The community agroforestry development model SFA and Timberland put into effect in the rural Haitian community of Gonaïves has boosted agricultural output by some 50 percent, lowered input costs and significantly raised net incomes for farmers and their families, SFA co-founder Hugh Locke highlighted. Since launching the program in 2010, agroforestry co-op membership has shot up over ten-fold to include some 1,000 farm households spread across two co-ops and two satellite sites. Trees are now being planted at a rate of over 1 million per year. 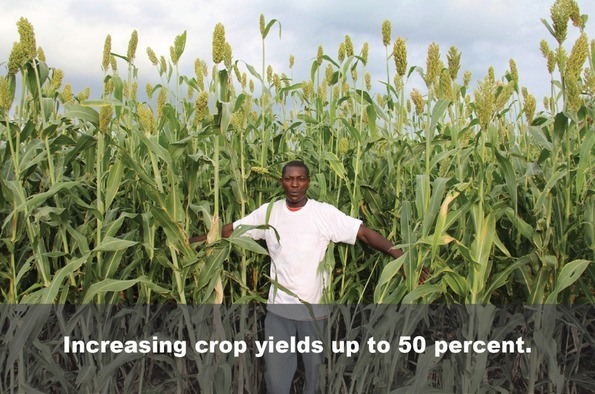 A network of tree nurseries serves as the nucleus of the program, with SFA working with around 24 or so tree species as well as a host of crops important to local farmers, such as sorghum and beans. Timberland and SFA expect to surpass their goal of facilitating the planting of over 5 million trees – self-financed and managed by small-scale farmers – over five years. Discussing the benefits being realized by Haiti's small-scale farmers, Locke said he prefers to view them from the perspective of outcomes as opposed to output. Feedback from farmers commonly includes them saying that “they are now able to put all their kids through school,” he told 3p. Small-scale farmers participating in the program, for example, are showing initiative and putting some of the free time they have gained to good use. They have taken it upon themselves to revive “kombit” – a traditional, informal organizational structure associated with communal farming activities, Locke pointed out. Based on farmers' requests, SFA also helped establish Kay Plante, a microfinance-driven “farmers' house.” The community agricultural co-op shop – the first of its kind in Haiti – offers farmers the opportunity to buy their own supplies and serves as a community resource for sharing information. The working language, moreover, is Creole. As most small-scale farmers don't know how to read or write, SFA also worked with co-op participants to launch an adult literacy program. In addition, SFA and Timberland took explicit steps to include women and foster greater gender equality among Haiti's small-scale farmers. The program allows both husband and wife volunteer-farming family members to participate in the program, Locke explained. Over time, SFA and Timberland have found that program participants become involved to a greater degree and develop a true sense of ownership in the community agroforestry co-op. By their third year of participation, farmers “feel a sense of ownership in the program that cannot be corrupted,” Locke told 3p. All that said, what's in it for Timberland, and why did they choose SFA from among all the project proposals the company fields? Fostering greater levels of customer engagement was one strong motivating factor, Margaret Morey-Reuner, Timberland's director of values marketing and strategic partnerships, explained. The company had been considering planting trees for a long time as a way to leverage its tree symbol to connect and engage with customers, she told 3p. Having formed a partnership with Haiti-born singer/musician Wyclef Jean to help Haitians recover from the 2010 earthquake, Timberland's CEO asked Morey-Reuner and team to see if they could find a prospective project in Haiti. By way of Jean, Timberland's team met SFA's co-founders. SFA's agroforestry project also afforded Timberland the opportunity to engage its own employees and build on the track record of volunteer development work the company has achieved through its “Path of Service” program. Timberland employees have voluntarily accumulated over 1 million hours of community development work and participated in thousands of “Path of Service” projects in countries around the world, Morey-Reuner highlighted. Another big motivating factor was Timberland's longstanding presence in the neighboring Dominican Republic, which dates back some 30 years. “We have employed successive generations of workers at our factory in the DR, and obviously there's great need [for reforestation and agricultural development] in neighboring Haiti,” Morey-Reuner elaborated. Finally, Morey-Reuner continued, in the back of Timberland's collective mind was the prospect that the sustainable development project model Locke and Timote came up with could be replicated, scaled and implemented in smallholder farming communities that produce raw materials Timberland uses in its supply chain, such as cotton and rubber. That's exactly how events have developed. Timberland is now in the early stages of planning to replicate SFA's program in other countries where it sources raw agricultural materials. “This past November we brought a Timberland brand of tires with a very controlled recycling process to market,” Morey-Reuner noted. Timberland collects the tires, which are produced by its partner Omni United, and recycles into shoes and boots. Omni and Timberland, she continued, “are seriously considering” employing SFA's community agroforestry development model in countries where natural rubber for their line of tires is sourced. Similarly, Timberland is working with its parent company, VF Corp., to replicate SFA's community agroforestry development model among its supply chain partners. Replicating the SFA model in countries where Timberland sources cotton would be a natural fit given the fact that VF is a member of the Better Cotton Initiative, Morey-Reuner pointed out. Both prospective development projects hold the potential to have a direct impact on, and benefit, Timberland's supply chain. They could also bolster the company's strategic corporate social and environmental responsibility efforts.